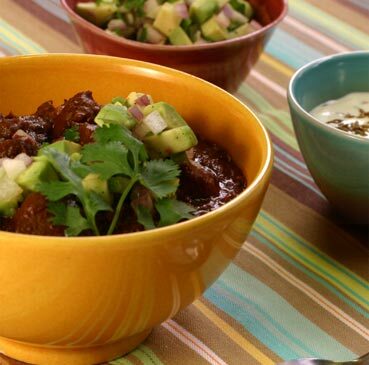 This is vegetarian chilli verde – a version of chilli con carne using green vegetables and black beans. I don’t claim that it is authentic – but it is as healthy and hearty as it is tasty. Serve alongside cumin-flecked sweetcorn and tomato rice. Serves 4 to 6. 1. Grill the green peppers and chillies until their skins are charred. Remove their skin. Halve the peppers and chillies, remove the seeds, and coarsely chop. 2. Place the peppers and chillies in a food processor, along with spring onions, tomatoes, spinach and seasoning. Blend to a puree, with a couple of tablespoons of water if necessary. 3. Heat the oil in a heavy saucepan, and fry the onions and garlic until soft but not brown. 4. Add the mushrooms, and cook for 5 to 10 minutes. Add the beans, stock, and the green vegetable puree, and simmer, uncovered, for 5 minutes. 5. Add the broccoli and dried spices and herbs, cover and cook for a further 10 minutes. Adjust the seasoning to taste. 6. Ladle into individual bowls, and serve with as many of the suggested accompaniments as desired.